Summary: Memorial Day is often used for self-congratulation or celebration. Some are seven ways we can honor the sacrifices made by our veterans. Make Memorial Day a big day. Our men and women in uniform served this nation. Most contributed their time and energy. Many contributed much more. Some contributed all they had to give. Here are suggestions about ways we can honor that sacrifice. (7) Memorial Day – the basics. 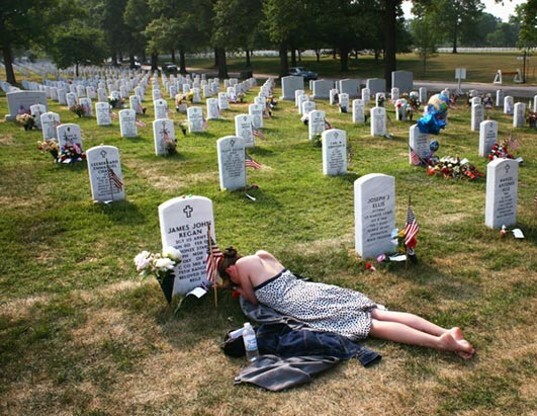 Visit cemeteries to place flags or flowers on the graves of our fallen heroes. Visit war memorials. Fly the U.S. flag at half-staff until noon. Join or cheer a parade! Donate to support the Blue Star Mothers of America. “We are mothers who now have, or have had, children honorably serving in the military. We are a non-profit (501[c]3) service organization supporting each other and our children while promoting patriotism. “The Blue Star Mothers of America, Inc. is a non-partisan, non-political organization. We do not support any political candidate, nor do we endorse any religious organization. The military represents all aspects of America as does our organization. Volunteer or donate to support the USO. “The USO strengthens America’s military service members by keeping them connected to family, home and country, throughout their service to the nation. Whether helping a soldier with a connecting flight, distributing a Care Package, serving snacks with a smile, providing local information, or “welcoming home” troops from deployment, USO volunteers are vital to the success of the USO’s mission. For example, helping a group of tired young men and women at 1 am in the USO at Los Angeles airport, grateful for place to relax, eat (free), and call home – hanging out for hours until their flight out. While the duties of a volunteer vary, the goal is always the same: to improve the quality of life for service members, to boost their morale, and to serve as the link between service members and the American people. Learn how you can volunteer at the VA.
See the Department of Labor’s website with resources for employers. There is no excuse for underfunding care for veterans. Many will require immediate care. Some will require long-term care. Persecuting the VA officials who attempt to spin gold from straw — making do with the inadequate dollars that Congress provides – does not help. Write your Representative and Senators! Tell them to adequately fund the VA now. After 150 years of frequent wars, perhaps we need to up our game as the list of American dead grows longer. Let’s end wars that do nothing for America’s security, like Vietnam, Iraq, and Afghanistan. Our troops pay the price for our folly. Not all the deeds done by our troops have been glorious, nor have all their missions been just or even good. But that is our responsibility, not theirs. America is a democracy. We bear the full responsibility, collectively, for sending our troops into harm’s way. We bear the responsibility for what they do and for what happens to them. Let’s not have to build more monuments like this, unless we’re attacked. A reminder about Memorial Day. It’s not national BBQ day. Previous Post Celebrate our mad trillion dollars in national security spending! Next Post The fast rise and fall of two industries show the coming singularity. Let’s prepare now.